It’s official! The Office of Management and Budget (OMB) has announced that for fiscal year (FY) 2015, federal agencies will not have to worry about sequestration-related budget cuts. That’s now two years in a row that sequestration has been removed from the radar. In their latest sequestration update report to Congress, OMB provides their analysis as to why agencies have dodged the sequestration bullet as laid out in the 2011 Budget Control Act (BCA). The report was recently addressed in a Federal News Radio article. The biggest reason agencies are not feeling quite the same sequestration pressure is because Congress worked out a deal back in 2013 to this effect. Under the two-year Bipartisan Budget Act (BBA) of 2013, which covered FY 2014 and FY 2015 budget levels, agencies were subject to smaller reductions in the spending caps in 2015 than originally set forth in the BCA. Given that Congress has the Department of Homeland Security (DHS) operating under continuing resolution (CR) until mid-February it is possible that some of this budget breathing room will be used when Congress finishes its DHS appropriations bill in the coming weeks. As law, the “sequestration ball” remains in the hands of Congress to determine how to move forward. OMB recognizes that “the BBA restored $22.4 billion each ($44.8 billion in total) to the 2014 defense and non-defense categories and replaced the reductions for 2015 that would have taken place with smaller reductions of $44.7 billion to the defense cap and $27.6 billion to the non-defense cap.” So Congress provided some budgetary relief and breathing room without completely overturning sequestration rules set in the 2011 BCA. The big question is whether Congress will take similar action for FY 2016 and beyond, or possibly even remove the BCA caps all together – a possibility that remains unclear with the increase in Republican majority in the House and a new Republican majority in the Senate. One thing seems certain. 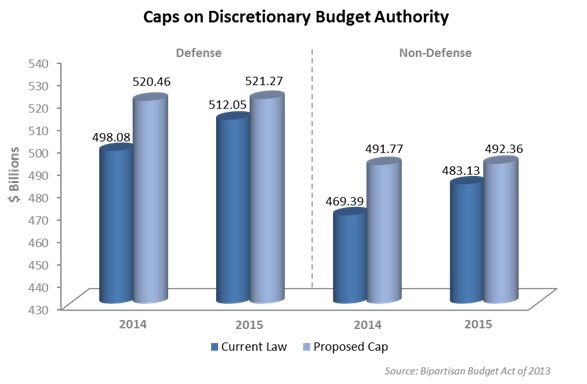 Unless the Congress takes actions similar to the 2013 BBA the sequestration reductions in the BCA will remain the discretionary caps for 2016 through 2021. That will surely color the debate over the FY 2016 budget which was just released this week. Originally published for Federal Industry Analysis: Analysts Perspectives Blog. Stay ahead of the competition by discovering more about GovWin FIA. Follow me on Twitter @GovWinSlye. DISA Contract Consolidation: Which DECC Support Contracts are the Most Likely Targets? At its recent Forecast to Industry event, officials from the Defense Information Systems Agency (DISA) spent a lot of time talking about two things – driving down costs and consolidating contracts. The latter, it was explained, is being done to achieve the former, with both trends being driven by the meat-cleaver budget cutting approach known as sequestration. Sequestration is coming to the fore once again as a result of budget planning that is now taking place for fiscal year 2016. The Department of Defense received a slight reprieve from budgetary pressure in fiscal 2014 and 2015 due to the passage of the Bipartisan Budget Act of 2013. Come October 1, 2015, however, sequestration will return with a vengeance. DISA officials can see the light at the end of the tunnel and they know that light is a fiscal train heading their way. Therefore, extensive talk of budget cuts and contract consolidation at the industry forecast event is a way of preparing industry for the blows that are about to fall. Talk of contract consolidation is bound to make vendors nervous, so in today’s post I’ll do my best to identify the contracts supporting DISA’s Defense Enterprise Computing Centers (DECCs) that are most likely to be targeted. Next week I’ll shift the focus to those supporting the Defense Information Systems Network (DISN). The available data on DECC support contracts has some holes in it, but I’ll shed light where I can. By my count, and using data DISA provided in its Exhibit 300 business case for FY 2014, there are currently 53 contracts in place supporting DISA’s DECCs. These contracts expire in the following timeframes, assuming all of their option years are exercised and assuming the data provided by DISA is accurate. For our purposes let’s assume the 43 contracts expiring from FY 2015 to FY 2017 are in the crosshairs for consolidation. According to Dave Bennett, DISA’s Chief Technology Officer, the contracts that provide support services to the DECCs on a regional basis will be looked at the hardest; the rationale being that as DISA transitions to an enterprise services model, there will be less of a need for location-specific support. Of the contracts above, here’s how the numbers break out by primary place of performance. Clearly, the lion’s share of support work is centered around the DECC located in Mechanicsburg, PA. I am going to assume based simply on the range of customers using them, that the Mechanicsburg and Ogden DECCs are the largest and closest to the “center.” They will therefore be subject to the least amount of contract consolidation. This leaves the greatest possibility of contract consolidation at OKC, Chambersburg, Montgomery, St. Louis, Columbus, Falls Church, and in other locations. Of these places, I would suggest that OKC and the other locations will see the most contract consolidation. Presumably, Chambersburg can be left out of the equation because data center operations there were phased out earlier this year. I suggest OKC because it has the second highest number of support contracts. I suggest the other locations because these are single-contracts for individual locations, meeting Mr. Bennett’s criteria as “regional” support contracts. Here is a list of the contracts and vendors working in OKC and in the other locations. Read into this what you’d like, but to me all these sole source awards scream consolidation. Why? Because at the forecast event MG Al Lynn, the Senior Procurement Executive at DISA, promised that DISA would compete contracts to drive down costs. Even Sharon Jones, DISA’s Small Business Representative, stated that contracts would be consolidated. In other words, small businesses too will feel the pain of consolidation and for my money these sole source awards stick out like a sore thumb. How about the other locations? Of these contracts only the one held by Nova Corporation is an 8a sole source award. The work, however, is also being done at DISA HQ, so it is up in the air. The contract held by Vion is the Enterprise Storage Solutions contract that is already in the process of being recompeted. The rest of these contracts are all one offs providing support at locations that are not in close proximity to DISA DECCs. If we take Mr. Bennett at his word, presumably these contracts too are prime candidates for consolidation. Readers will please take into consideration the fact that I don’t have any information suggesting these contracts are definitely targeted for consolidation. Similarly, I have no information suggesting the other contracts not listed here are not also being considered for consolidation. The safest bet would be to assume that all DECC support contracts will be reviewed. This said, based on the few comments made so far about consolidation, the contracts listed above best fit the bill. For this reason they are the ones worth watching the closest in the years to come. The federal acquisition landscape and procurement processes are complex, to say the least, and people on both sides of the process – government and industry – have their own perspectives on what works and what could be better. At an industry event focusing on federal acquisitions, the similarities and difference in perspective among both sides of the equation made it clear that the challenges to improve federal acquisitions will persist for some time. Recently, I attended AFCEA International’s Defense Acquisition Modernization Symposium: "Better Buying Power: Do We Have It Right?" The two-day event featured several keynote presentations from current government acquisition leaders, like Frank Kendall, Under Secretary of Defense, Acquisition, Technology and Logistics, as well as former government leaders and industry professionals with insight into the current and future state of the federal acquisition environment and best practices. Approximately 70% of the attendees were government personnel and most of them were from the federal acquisition community, which gave the symposium a different tenor than so many industry events that are predominately attended by those from industry. In his opening keynote, Frank Kendall outlined his thoughts on where he would like to see acquisitions headed, including better aligning contract incentives with performance so that profit follows performance. He also wants to build stronger partnerships with the industry community to improve both acquisitions as well as the solutions government is procuring. For his part, Kendall does not see acquisition as the source of the problem for program delays and failures. The root cause of delays is in the plan and execution itself, not acquisition, in Kendall’s view. He sees sequestration as still an issue, due to the uncertainty and inefficiency it introduces, but when asked if he thought it would be lifted he gave it no chance because Congress can’t agree on how to move forward. Kendall said that sequestration costs in FY 2013 for DoD were $37 billion and the same was true in FY 2014. In FY 2015 he sees it costing DoD about $10 billion. In FY 2016, however, the sequestration impact is still unclear. Lowest Price, Technically Acceptable (LPTA) – The increased use of LPTA has challenged both sides of the acquisition table and both sides say that they would like to see it used less than it is, but that pressure still exists to use it. Both sides find fault with LPTA – industry for its one-dimensional focus on price, and government because they are not confident in how to use it and don’t like what they are getting for their money. Communication – Government acquisition personnel continue to struggle with knowing when and in what way they can interact with industry, even years after the launch of OMB’s Myth Busters campaign. This lack of accessibility and awareness of their prerogative frustrates the industry side that is looking for information in order to respond to agency needs. Some in industry tend to lead with capability statements rather than seeking to understand the agency’s perspective. Disconnects – On some issues government and industry seem to have very different perspectives on the same issue. For example, government perceives they communicate effectively on program requirements and effectively leverages draft RFPs. Industry often sees draft RFPs that are incomplete or insufficient to provide guidance in designing solutions. Whether from within government or industry, presenters suggested that the best approach going forward was to focus on improving acquisitions from within the current system rather than asking and hoping for large scale acquisition reform because the complexity of the issues make it difficult to gain consensus in Congress and reform measures tend to have unintended downstream consequences that further exasperate problems. Originally published in the GovWin FIA Analysts Perspectives Blog. Follow me on Twitter @GovWinSlye. The U.S. Congress is expected to pass an omnibus funding bill for the remainder of fiscal year (FY) 2014 that includes $1 trillion in discretionary federal funds. The Hill reported that H.R. 3547 passed the House and is now moving onto the Senate. The bill is a compromise measure in keeping with the budget agreement the two parties reached late in 2013. As such, the bill is set to increase total discretionary spending to $1.102 trillion in FY 2014, an increase over the $986 billion that was originally planned. If the final bill passes the Senate and is signed by the President, as is expected at the time of this writing, another looming government shutdown will have been averted. Further, departments and agencies that have been coping with the limitations imposed under the “same stuff, different day” scenario that accompanies continuing resolutions (CR) will have real appropriations with operating budgets and more program flexibility, even if their budgets don’t necessarily grow. The pending omnibus would, in one sweeping appropriations, address funding for each of the agencies covered under the twelve individual appropriations bills that traditionally make their way through Congress. Barring any unexpected changes in either chamber, a summary of the appropriation’s impact on departmental budgets is presented in the table below and following descriptions. Total FY 2014 funding is set at $572B and includes $487B in base budget and $85B for OCO. Military Personnel (MILPERS) - $129B, up $1.3B from FY 2013. Includes 1% pay raise for armed forces and civilian workforce, the first civilian raise in 4 years. Procurement - $92.9B, down $7.5B from FY 2013 enacted level. Includes a 1% pay raise to members of the Armed Forces and the Department of Defense civilian workforce. This is the first pay raise for Department of Defense civilians in four years. Supports readiness with O&M funding that is $11B higher than under a full-year CR. Provides $1B billion for the National Guard and Reserve Equipment Account to ensure Guard and Reserve units have the critical equipment necessary for both homeland security and overseas missions. Adds $175M for the Rapid Innovation Program and $75M for the Industrial Base Innovation Fund to promote the development of new technologies and timely fielding of critical equipment. Instead of across-the-board sequestration cuts, the bill proposes 1,065 specific cuts to programs and redirects some of those funds to higher priorities. $45M from follow-on development of the Navy’s E-2D Advanced Hawkeye aircraft due to contract delays. The bill provides no new funding for ObamaCare, and holds the line on ObamaCare funding in CMS. $305 million for CMS to allow for the timely processing and payment of benefits, and the continuation of essential services for the increasing number of Americans who rely on traditional Medicare programs. $250 million for rural health care, including telehealth and mobile clinics, for veterans in rural and highly rural areas, including Native American populations. Minor Construction within the VA is funded at $715M – the same as the President’s request and $108 million above the fiscal year 2013 enacted level. Overall FY 2014 discretionary spending for DHS is $39.3B, a reduction of $336 million from the FY 2013 enacted level. Coast Guard: $10.2B overall, of which $8.7B is discretionary spending. The bill also provides $425 million in targeted increases above the FY 2014 request to support front line personnel with resources, including $23 million and $2 million respectively for pre-acquisition design work of the Offshore Patrol Cutter and for initial acquisition planning and design of a new polar icebreaker. Transportation Security Administration (TSA): $7.4B for TSA is reduced by $2.1B in offsetting collections and fees. The bill includes funding for investments in explosives detection systems, passenger screening technologies, and air cargo security. The bill includes $177 million for passenger screening technologies, $93 million for Secure Flight, which matches passenger data against records contained in portions of the Terrorist Screening Database, $83 million for expedited and other vetting programs, and $25 million for the Federal Flight Deck Officer and Flight Crew Training program. U.S. Customs and Border Protection (CBP): $10.6B, which adds $111 million above the FY 2013 enacted level. Adds $91 million above the budget request for Air and Marine operations and procurement of critical assets, including enhanced radar for unmanned aircraft systems and restoring the 30% cut to flight hours proposed in the budget. Adds $10 million for trusted traveler programs, including additional Global Entry kiosks and mobile document readers, expanding preclearance activities, and for border transformation programs like the land border integration effort and the port runner/absconder program. U.S. Immigration and Customs Enforcement (ICE): $5.6B for ICE, of which $2.8B is for detention and removal operations, including border patrol, special agents and immigration officials. United States Citizenship and Immigration Services (USCIS): $116 million in direct appropriations for USCIS and with $114 million, fully funds the E-Verify employment eligibility verification system. United States Secret Service: $1.6B, expands cyber training provided by the Secret Service to state and local law enforcement officials, grows cooperation between the Secret Service and the FBI in cybersecurity, and maintains the Service’s primary role in protecting U.S. financial systems in cyberspace. Domestic Nuclear Detection Office (DNDO): $285 million, including $14 million for handheld portable radiation detectors, $71 million for research and development of next-generation detection technologies, and $22 million for the Securing the Cities program. Science and Technology (S&T): $1.2B, sustains investment in high-priority research and development efforts, including $404 million in funding for the construction of the National Bio- and Agro-Defense Facility (NBAF). Office of Health Affairs (OHA): $127 million, including $85 million for the Bio-Watch Program and $2 million to complete demonstration projects through the Chemical Defense Program. HUD’s operating budget declines this year as FY 2014 discretionary funding of $32.8B represents a 2% decrease from the FY 2013 enacted level of $33.5B. $36M for the HUD OCIO. $250M for development, modernization, enhancement and maintenance of Department-wide and program-specific IT programs. Bolsters resources for DOJ capabilities to counter growing cyber threats. Within 120 days of enactment, DOJ is to provide a multiyear strategic plan that identifies resources, programs and coordination structures need to enable prevention of and more rapid response to future cyber attacks. Justice Information Sharing Technology (JIST): $25.8 million in funding for JIST, as well as enabling the Attorney General to transfer funds to this account from funds available to DOJ for enterprise-wide IT initiatives. National Security Division (NSD): $91.8 million for the NSD, including funds to support the Intelligence Community to combat cyber threats at with resources that at least match FY 2013 levels. Federal Bureau of Investigation (FBI): Receives $8.3 billion, an increase of $232 million over FY 2013 enacted levels. $8.2 billion for salaries and expenses of the FBI. The FBI is expected to increase resources for the National Instant Criminal Background Check System (NICS) by $60,000,000 to expand capacity of NICS to meet rising demand for system resources. Drug Enforcement Administration (DEA): $2.4 billion, marking a rise of $21 million over FY 2013 levels. Includes $361.0 million for regulatory and enforcement efforts to combat prescription drug abuse. Bureau of Alcohol, Tobacco, Firearms and Explosives (ATF): $1.18 billion, an increase of $47 million over FY 2013 enacted. Includes resources for the updating and expanding of the National Integrated Ballistic Imaging Network (NIBIN). U.S. Marshals Service: $2.7 billion, marking a decrease of $72 million from FY 13 due to reduced estimates for federal detention requirements. Federal Prison System (BOP): $6.9 billion, an increase of $79 million above FY 2013 enacted. Maintains staffing levels and continues activation of new prisons. Grants Program: $2.2 billion for various state and local grant programs, $32 million above FY 2013 enacted level. State and Local Law Enforcement Assistance: $1.17 billion for initiatives including victims of human trafficking, DNA grants, Byrne-Justice Assistance Grant (JAG) subgrantees, as well as National Instant Criminal Background Check System (NICS) Initiative grants. National Nuclear Security Administration (NNSA): Receives $11.2 billion to maintain the safety, security, and readiness of the nation’s nuclear weapons stockpile. Increases funding for Weapons Activities by $847 million over FY 2013, providing $7.845 billion in FY 2014. Critical defense funding upholds national nuclear deterrence posture. Includes $537 million to extend the life of the B61 nuclear bomb. Science Research: Office of Science receives $5.071 billion ($450 million over FY 2013) for breakthroughs in energy applications and development of next-generation high performance computing systems. Provides $280 million for Advanced Research Projects Agency-Energy (ARPA-E), an increase of $29 million over FY 2013, to develop promising/high-risk future energy technologies. Energy and Efficiency and Renewable Energy (EERE) programs receive $1.9 billion, an increase of $182 million over FY 2013, to advance biomass, electric vehicle, and energy efficient advanced manufacturing technologies. Defense Environmental Cleanup receives $5.0 billion, an increase of $381 million above FY 2013. Cuts funding for Nuclear Nonproliferation by $289 million from FY 2013, providing $1.954 billion for FY 2014. Provides $147 million for Electricity Delivery and Energy Reliability, including $5 million within Cyber Security for Energy Delivery Systems to enhance full-scale electric grid testing capabilities associated with integration of wireless technologies, power generation, and communications and control systems. USDA’s operating budget is a winner this year as FY 2014 discretionary funding of $20.9B represents a 2% increase over the FY 2013 enacted level of $20.5B. Budget contains requirements for the Secretary of Agriculture to eliminate waste, fraud, and abuse in the Supplemental Nutrition Assistance Program. Makes cuts to lower-priority programs. Provides $44M for the USDA OCIO, no less than $27M of which is to be spent on USDA cybersecurity requirements. Provides $4.2M for APHIS’ IT infrastructure. Increases CIO governance over IT expenses, requiring the CIO to approve of any investment greater than $25K before the investment is made. Stipulates no new IT system or upgrade of current systems may be acquired without OCIO and Executive IT Investment Review Board approval. DOT’s operating budget is flat this year as FY 2014 discretionary funding of $17.8B represents a 0.5% decrease from the FY 2013 enacted level of $17.9B. Funding for FAA NextGen investments is preserved. $15.7M for the DOT OCIO. $7M for upgrading and enhancing the DOT’s financial systems and re-engineering business processes. Preserves balance of NASA portfolio across science, aeronautics, technology and human space flight. Asteroid Redirect Mission (ARM): Completion of significant preliminary activities is needed prior to NASA and Congress making long-term commitment to this mission concept. Science: Funding totals $5.15B, including Education and Public Outreach, Earth Science, Planetary Science, Astrophysics, and Heliophysics. Prior to expending any funds on the development of JPSS climate sensors, NASA is to prepare development plans with notional budget and schedule details for submission to the Appropriations Committee. Under Planetary Science, Mars Exploration receives $288 million, including $65 million for the development of the Mars 2020 Rover. Aeronautics: Funding amounts to $566 million. Space Technology: Funding totals $576 million. Exploration: $4.1 billion for Exploration mission directorate, including Multi-Purpose Crew Vehicle and Space Launch System programs. $1.6 billion is provided for the Space Launch System (SLS) to sustain core development of mission components. Due to concerns regarding diversion of funds for activities with only tangential relevance to the SLS, NASA is expected to complete quarterly spending reports on additional potential for the investment along with tracking milestones and development schedules. $1.2 billion is provided for the Orion Multi-Purpose Crew Vehicle, including $3 million for Construction and Environmental Compliance and Restoration. Space Operations: $3.8 billion for Space Operations, including strong support for the International Space Station (ISS). Cross Agency Support: $2.8 billion in Cross Agency Support funds security, infrastructure, and reports. Office of Inspector General to receive $37.5 million. Administrative Provisions include establishing terms and conditions for the transfer of funds. $92M to help address identity theft and refund fraud, combat offshore tax evasion, and improve delivery of services to taxpayers. $313M available until 9/30/16 for capital asset acquisition of IT systems, including management and related contractual costs for business systems modernization. $954 million for the Bureau of Reclamation’s Water and Related Resources, $106 million over FY 2013. Bureau of Land Management (BLM): Funded at $1.1 billion, marking an increase of $7 million above FY 2013 enacted. Provides for effective stewardship of public lands. National Park Services (NPS): $2.6 billion, an increase of $28.5 million over FY 2013 enacted. Allows every national park to remain open for the duration of FY 2014. U.S. Forest Service: $5.5 billion, including increases for wildfire fighting and management. United States Geological Survey (USGS): Provides $1.03 billion for Surveys, Investigations, and Research, including an increase of $400,000 for data preservation. American Indian and Alaska Native Programs: Provides funding for health care, law enforcement, and education. Indian Health Services: Receives $4.3 billion in funding, an increase of $78 million over FY 2013 enacted levels. Bureau of Indian Affairs and Education: Provides $2.5 billion in funding, an $18 million increase over FY 2013 enacted levels. U.S. Fish and Wildlife Service (FWS): $1.4 billion, a decrease of $32 million from the FY 2013 enacted levels. This funding provides for compensating ranchers for livestock loss, stopping spread of mussel and fish varieties, and species conservation. Fully funds request for information technology management. National Oceanic and Atmospheric Administration (NOAA): $5.3 billion, marking an increase of $310 million over the FY 2013 enacted levels. Including $953.6 million for the National Weather Service as well as $187.1 million for the National Environmental Satellite, Data and Information Service (NESDIS) operations, research, and facilities. Fully funds NOAA’s weather satellite programs (GOES-R and JPSS). Although NOAA is expected to focus on the weather satellite program and to better address gaps in its FY 2015 budget, NOAA will continue to provide quarterly updates to the Committees on Appropriations regarding its weather satellite portfolio. Bureau of Census: $945.0 million, including $693.0 million for periodic censuses and programs. United States Patent and Trademark Office (USPTO): $3.0 billion, marking an increase of $91 million over FY13. Maintains provision that USPTO makes available any fees collected in excess of estimates. Adopts language from the House and Senate reports for Patents End-to-End. USPTO will submit a report to the Committees on Appropriations within 90 days of the Act’s enactment. National Institute of Standards and Technology (NIST): $850 million for NIST, increase of $41 million over FY13 enacted, including $651.0 million for NIST’s scientific and technical core programs. Increase of $5.0M for cyber security research. Increase of $1.0M for disaster resilience research. $4.0M for the National Initiative for Cybersecurity (NICE) Program. $15.0M for the National Cybersecurity Center of Excellence. $16.5M to maintain the current operating level for the National Strategy for Trusted Identities in Cyberspace (NSTIC). International Trade Administration (ITA): $470.0 million in total resources, offset by $9.4 million in estimated fee collection. Bureau of Industry and Security (BIS): $101.5 million for operations and administration. Economic Development Administration (EDA): $246.5 million for programs, including $209.5 million for Economic Development Assistance Programs. Minority Business Development Agency: Receives $28.0 million in funding. Economic and Statistical Analysis: Provides $99.0 million in funding. Working Capital Fund: Rather than supporting the level requested for the WCF, the Commerce Department is expected to submit a list of transfers to and activities funded from the WCF along with its 2014 spending plan. The agreement supports the plan to establish the Enterprise Security Operations Center from the WCF. Fellow GovWin Federal Industry Analysis (FIA) analysts Kyra Fussell, Angela Petty, and Alex Rossino contributed to this entry. Originally published for Federal Industry Analysis: Analysts Perspectives Blog. Stay ahead of the competition by discovering more about GovWin FIA. Follow on twitter @FIAGovWin. The December budget deal received a lot of media attention, but it only marked the first step in the budget process. Current stopgap spending expires January 15, 2014. Without new spending authority in place, the government could partially shut down again. This rapidly approaching January deadline is where the rubber meets the road for agency funding decisions. A month ago, the Bipartisan Budget Act of 2013, proposed by House Budget Chairman Paul Ryan (R-WI) and Senate Budget Chairwoman Patty Murray (D-WA), laid out top-line spending levels for the next two fiscal years, funding agencies through the fall of 2015. This plan essentially split the difference between the Senate and House budget for overall discretionary budget authority for the current fiscal year. It also reduced scheduled spending cuts by $63 billion over two years, essentially dulling the near-term impact of sequestration. 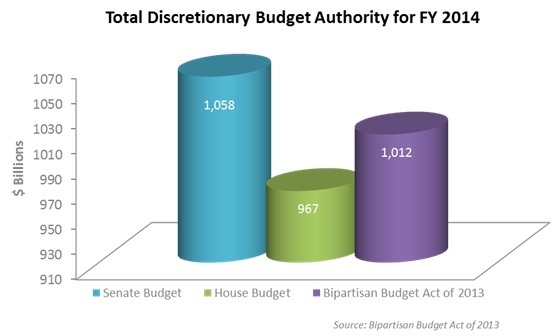 The top-level caps for discretionary budget authority would enable a rise in spending above current law. For Defense, this increase would be 4.5% in FY 2014 and 1.8% for FY 2015 from current levels. 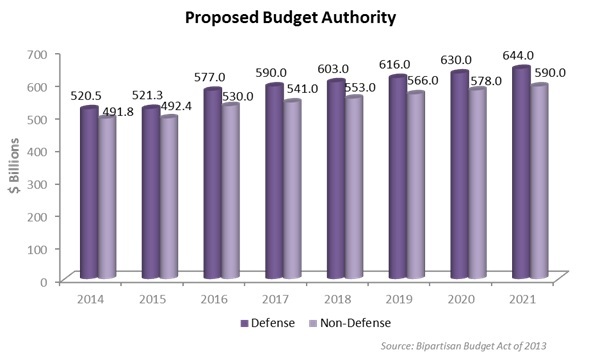 Non-defense discretionary budget authority would rise above current levels by 4.7% in FY 2014 and 1.9% in FY 2015. A week out from the January 15th deadline, negotiators reported progress in reaching agreement on a $1.1 trillion spending bill to fund the government through September. This bill would mark the crucial next step in the budget process. This step is comprised of the line-by-line agency spending for the rest of fiscal 2014. On Tuesday, January 7th, Senate Appropriations Committee Chairwoman Barbara Mikulski (D-MD) voiced optimism about reaching an agreement on an omnibus spending measure. Agency budgets close to being settled at the start of the week include the Defense Department, along with Commerce, Justice, Agriculture, Housing and Urban Development, Veterans Affairs and Transportation. In an interview with the Associated Press, Mikulski noted that negotiators were, “looking at narrow the differences, looking at … how we can compromise without capitulation on both sides.” Issues that could still present hurdles for the bill include health care and financial sector reform, environmental and labor regulations. With current continuing resolution nearing its expiration and Congressional recess on January 17th, a temporary measure has not been ruled out to extend funding if additional time is needed to address final details. In the meantime, the goal for legislators remains completing all 12 funding bills before the January deadline. These spending bills are particularly important for government contractors looking for indications of agency priorities and program spending over the next two years. While top-level figures provide a sense of overall government spending, that’s just the start of the budget process. Appropriations committees still have to establish department spending limits from which program-level spending will be determined. And, it’s only once those figures are set that agencies are able to make decisions about specific initiatives and contracts. Originally published for Federal Industry Analysis: Analysts Perspectives Blog. Stay ahead of the competition by discovering more about GovWinIQ. Follow me on twitter @FIAGovWin. Late Tuesday, December 10, 2013, House and Senate negotiators announced they’d reached agreement on a two-year budget deal. The plan comes just ahead of the December 13th budget conference deadline, and it proposes top-line budget authority figures that would temper the spending cuts of sequestration over the next two years. The Bipartisan Budget Act of 2013, proposed by House Budget Chairman Paul Ryan (R-WI) and Senate Budget Chairwoman Patty Murray (D-WA), lays out top-line spending levels for the next two fiscal years, funding agencies through the fall of 2015. For the current fiscal year, the plan essentially splits the difference between the Senate and House budgets for overall discretionary budget authority. This bipartisan plan would reduce spending cuts by $63 billion over two years, split evenly between defense and non-defense programs. This relief is offset by savings elsewhere in the budget through deficit reduction provisions, elimination of unobligated forfeiture funds at the Department of Justice and Department of Treasury, as well as additional mandatory savings and non-tax revenue. These savings combine to total approximately $85 billion. The plan expects to save $28 billion over ten years by extending the percentage of sequestered mandatory spending in 2021 into 2022 and 2023. The House of Representatives is expected take up the proposal for vote Thursday, December 12, 2013. After that, it will go to the Senate. If the bill is signed into law, the real work around appropriations will start as committees begin negotiating spending bills to meet the January 15, 2014 deadline. What Will DoD Sequestration Cuts Look Like in FY 2014? The Government Accountability Office (GAO) recently released its Observations on the Department of Defense's Approach to Sequestration in Fiscal Year 2013 and what the report reveals for the future is not encouraging. According to the GAO, the DoD responded to fiscal 2013 sequestration cuts by reducing spending in some places, reprogramming spending in others, and by utilizing funds that remained from fiscal 2012 to cover shortfalls. In effect, the DoD waited until the last minute and then implemented a number of short-term measures intended to mitigate the immediate impact of the cuts without dramatically scaling back operations or cutting major weapons systems. The result of these steps was to postpone some planned equipment maintenance, to reduce some weapon system quantities purchased, and delay some systems development and testing until FY 2014. All of this was done in the hope that Congress and the President would find a way to reverse the insanity of sequestration cuts. That’s the good news. The bad news, the GAO reports, is that these same short-term measures will not be available in fiscal 2014, meaning the DoD is now forced to deal with impact of deep cuts in its budget. The implications of this for industry are not pretty. After years of budgetary expansion, the DoD will be scaling back spending in every area, presumably even in Information Technology. Cuts in IT are anticipated despite the fact that IT can enable users to “do more with less.” So, where will the axe fall? Data contained in the GAO’s report may offer clues. The following table from the GAO report shows that in percentage terms the DoD’s Procurement and Research, Development, Test, and Evaluation (RDT&E) budgets took some of the hardest hits in fiscal 2013. How would this picture look using FY 2014 numbers? Sequestration cuts approximately $52 billion from the DoD’s base discretionary budget of $527 billion, assuming Congress extends the current Continuing Resolution (in itself a disaster) through all of fiscal 2014. The cuts effectively reduce the DoD’s FY 2014 base discretionary budget to $475 billion. Looking at the $37 billion “amount of reduction” above it becomes clear that the DoD will need to cut approximately another $15 billion. The table below approximates how those cuts will look in 2014 if the DoD applies them in roughly the same proportion as it did in 2013. The big accounts for IT vendors to keep an eye on are Procurement and RDT&E. In this scenario those accounts would experience cuts totaling approximately $22 billion. Not all of these cuts would fall on IT projects, but it is almost certain that many programs will be affected. These impacts could range from milestone delays and scaled back program scopes to outright program cancellations. What can vendors do to mitigate the impact of these cuts on their business? Focus business development efforts on programs already in full swing. These programs will have incumbents so be prepared to fight hard for a piece of them as support contracts come up for recompetition. Incumbents, prepare to defend yourselves. Stay in your customers’ back pockets. Concentrate on programs mandated by Congress and/or Executive Order, like business system modernization and data center consolidation. By law the DoD is required to fund these efforts, making them as close to a ‘sure thing’ as is available in this market. Seek out and capture work related to Programs of Record. Even PoRs are not guaranteed funding nowadays, but you can probably count on them being first in line if funding becomes available. Communicate how your solution or service can save money. Areas like systems automation, cloud computing, and, to an extent, big data, should be strong plays. Most of all maintain a sense of perspective. Even with the cuts the DoD will be spending tens of billions of dollars on IT in FY 2014. Since the end of the government shutdown last week Army officials have been out and about sounding their frustration about the impact that sequestration is having on Army programs and troop readiness. Full public venting of their concerns came out at the 2013 Association of the United States Army Annual Meeting and Exposition. Army Secretary McHugh and Chief of Staff General Ray Odierno stated that many of the Army’s modernization programs are in serious danger from budget cuts. Army acquisition chief, Heidi Shyu stated, however, that some investment will continue in the Army’s Science and Technology (S&T) portfolio. Rickey Smith, Director of the Army Capabilities Integration Center—Forward, provided further details, noting that the Army’s S&T investment strategy focuses on human performance, advanced computing, and material sciences. It is the advanced computing piece of this equation that I’ll dig into in today’s post. As for the planned OBVP investment, this project focuses on developing next generation portable power sources for vehicle platforms to enable the use of on-board advanced computing and other power-hungry technologies. The work required entails laboratory testing of proposed solutions to investigate the viability of “high temperature power electronics compared to traditional power electronics for power generation.” Requested funding for this project in FY 2014 amounts to $2.41 million. Lastly, the C2 OTM investment “investigates, designs, and codes software to improve the Warfighter's ability to access, use, present, and understand relevant mission command information.” The effort focuses on developing “software and algorithms to increase unmanned platform autonomy and improve multi-platform autonomous collision avoidance” to improve mission command capabilities. The planned investment for this project in FY 2014 is $9.95 million. Presumably the industry partner would be required to work with PEO Command, Control, and Communications-Tactical (PEO C3T) on this effort. None of these investment amounts is staggeringly large, but in today’s fiscal environment every cent counts. If the Army says these are areas where spending will continue, then vendors are well advised to follow the breadcrumb trail. Further research did not turn up any contract opportunities specifically related to these investments so there is hope that competitions for contracts are still pending. Those interested should be aware that at least some of this work could be related to contract #W15P7T13D0054 awarded to DRS Technologies in June 2013 for Production of the Mounted Family of Computer Systems (M-FOCS) Hardware. There is a software component to the DRS contract, but for the most part it appears to be a hardware-focused effort. What Will the Impact of Sequestration be on Defense-Wide Budget Accounts? August feels different this year. Late summer in DC is typically slow, but it is also filled with anticipation for an uptick in business activity the final month of the federal fiscal year. This year, however, is filled with complications. When Congress kicked the can of divisive budgetary matters to the September-October 2013 timeframe, it made sure that the end of the summer would be hot with simultaneous debates about the debt ceiling, enacting sequestration, and the 2014 budget. As a result, this August feels more like Groundhog Day than it does the end of a sleepy DC summertime. The issues facing Congress have become so onerous that House Speaker John Boehner has already thrown in the towel and called for a short-term Continuing Resolution. Surely no one will be surprised if/when Boehner’s brief CR is extended once Congress finds that it cannot rise above partisan lines to agree on a FY 2014 budget. Because no one knows what the budget picture will look like in FY 2014, Deputy Defense Secretary Dr. Ashton Carter issued a memo in late May instructing the DoD to prepare for three separate budget scenarios: 1) operations at funding levels requested in the President’s FY 2014 budget request, 2) operations at 5% below those levels, and 3) operations at 10% below those levels. The third scenario takes into account a cut of $50 billion due to sequestration. Unlike FY 2013, the ‘good news’ this year is that the DoD will have the flexibility to choose where the cuts fall (vs. the uniform percentage cuts across budget accounts required for FY 2013). Commanders and agency heads across the department are therefore looking at program portfolios to determine what should stay and what must go. Where Are Cuts Likely to Fall? Those of us outside the process have no idea which programs are vulnerable. The best we can do is look at the budget accounts where DoD tends to spend the most and those that fund “programs of record” that tend to be mission critical and take an educated guess about the areas that might be most susceptible. 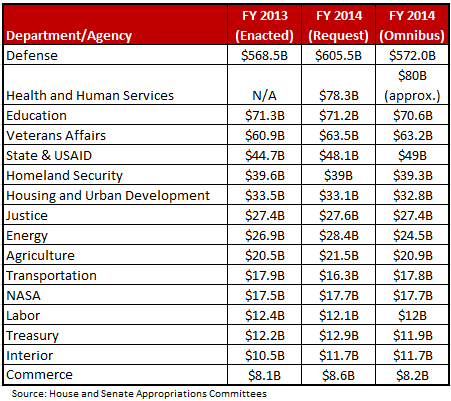 In today’s post I take a look at Defense Agency spending only, not spending by the Military Departments. To do this analysis I am relying on Federal Procurement Data System (FPDS) obligations data that I have parsed by Defense-Wide budget accounts. The data spans obligations over fiscal years 2011-2013, with the data for 2013 being only partially reported. As the graphic below shows, the three largest accounts are the Defense Working Capital Fund (DWCF) with $95 billion, Defense-Wide Operations and Maintenance (O&M) with $42 billion, and Defense-Wide Research, Development, Testing and Evaluation (RDT&E) with $19 billion in obligations respectively. Beyond these three accounts the nominal amounts available for cutting dwindle rapidly. Reducing the Defense Working Capital Fund is a non-starter because these funds are generated by services provided to Defense customers. It goes without saying that DWCF levels will also be falling in the years to come as Defense customers have less to spend. This leaves Defense-Wide O&M and RDT&E as the likely major targets for budget cuts in FY 2014 and beyond. Budgets for procurement and Defense Health Programs are sure to be cut as well, but I think the axe will fall heaviest on the Defense-Wide O&M and RDT&E budget accounts. Assuming Defense-Wide O&M is most susceptible to cuts, which contracts under this budget account are vulnerable to sequestration based on historical spending? The chart below shows the top 10 contracts/contract vehicles by obligations that fall under this budget account. As we can see, Encore II and SeaPort-e figure prominently. This suggests that active orders awarded through both vehicles have the potential to see spending cuts and cancellations as sequestration begins to bite. The Northrop contract for Joint Warfighting Center support is another case altogether. This contract was extended in March 2012, ostensibly to provide time for the follow-on Enterprise Joint Training Support contract to be competed. The competition for EJTS is now in source selection. One wonders if once this contract is awarded it will see only a trickle of business flow through it. Finally, the DSTS-G contract held by DRS has been replaced already by the GSA/DISA Future Commercial Satcom contract. Looking at vulnerable contracts/contract vehicles from the perspective of potential cuts to the Defense-Wide RDT&E budget account yields more bad news for active efforts under SeaPort-e and Encore II. In addition, some efforts under the Army’s Information Technology Enterprise Solutions – Services 2 (ITES-2S) and S3 vehicles could also see funding cuts and cancellations. Keep in mind that we are talking about active efforts in most cases that are still funded through the RDT&E budget account. The other thing to consider is a decrease in the number of contracts procured through these vehicles. If yet-to-be competed contracts are ultimately dependent on RDT&E dollars, then they are likely to not be competed at all. Although I’ve mentioned a few large vendors doing business with Defense Agencies, I don’t mean to pick on them specifically. The reality is that big programs and high spending make big targets in this environment, and unfortunately the vendors attached to those programs tend to rise to the top of the statistical heap. All vendors whose contracts are funded through the O&M and RDT&E budget accounts are very likely to see reduced obligations in the years to come. The question is how much and what vendors will do to mitigate the impact. When budget sequestration kicked in back at the end of February one of the most problematic issues with implementing the spending reductions was determining how much of these would come through the furlough of civilian federal employees – specifically, how many days would they be furloughed to achieve the needed reductions. The original estimate was 22 days, but as the dust settled the planned number was set at 11 days. As it turns out, that is not to be the final number. Last week, the Associated Press reported that the 11 days would be reduced by 5 days. So after months of sorting out just how to implement sequestration-related furloughs, they began in early July. And just about a month later, we’re learning that the end is already in sight. In fact, Defense Secretary Hagel announced this week that the last furlough day for FY 2013 is expected to take place on August 17. In last week’s entry I looked at what recent historical spending level data for could possibly mean for September, the busiest single month of the fiscal year. Over the last five fiscal years the four major Defense branches have averaged a combined $18 billion in IT contract obligations in the fourth fiscal quarter, $11 billion of which came in September alone. These contracts don’t get awarded without significant effort and support from civilian acquisition staff, so the impact of furloughs was a great concern for agencies trying to empty their backlog before the budget authority expires at year-end. The announced end of these furloughs means that any acquisition support staff that had been impacted by furloughs will be at full time and available to support the normal end-of-fiscal year spending push that typifies the majority of federal agencies. Granted, in his announcement Hegel attributes these reduced furloughs to Congress’ approval of the Pentagon’s plans to move funds from acquisition accounts into day-to-day operating accounts. That could definitely impact what gets spent on IT, especially on commodities. We could see a September that bucks historical spending trends, but at least we have the hope that whatever is approved to move forward won’t get caught in a processing chokepoint exacerbated by sequestration-induced short staffing. That is good news.